The National Weather Service has issued an excessive heat warning from Saturday all the way to Thursday with temperatures reaching highs of between 110 and 120 degrees. That kind of record heat has the region's utilities and transit agency, those serving the homeless and transient populations and hosts of businesses, including construction companies and others with outside operations getting ready. 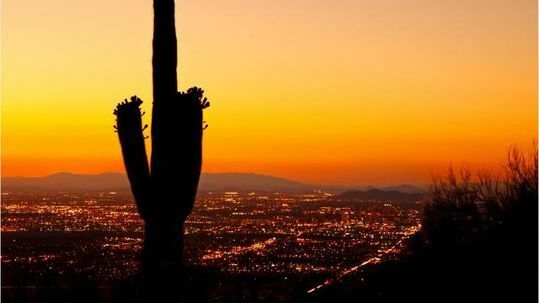 Air conditioning contractors and repair businesses are poised to make plenty of service calls and the region's two big utilities - Salt River Project and Arizona Public Service Co. - will have to be ready for potential issues and stresses on their power grids. Susan Tierney, spokeswoman for Valley Metro which operates the Metro light rail line, said the train system running from Mesa to Phoenix is built to withstand the scorching summer heat. "Overall, our system is designed to withstand our extreme temperatures. We are one of the only rail systems in the world that operates consistently in 100 to 110-plus temperatures. For our operations, preventative maintenance is key in keeping our HVAC units running on the vehicle fleet. There are four A/C units per car, which is enough power to cool for six average-sized homes," Tierney said. The Metro system is having technicians and other field workers take precautions on extremely hot days. Tierney said construction on the Gilbert Road extension in Mesa and the new Tempe Streetcar system tries to get more work done in the mornings before temperatures rise in the later afternoons. Kevin Maas, director of workplace safety at McCarthy Building Cos., said the construction firm makes sure workers have plenty of access to water and can work in shaded areas. "We enforce rest breaks throughout the workday and with more frequency during hotter temperatures, where 10-minute breaks are called by our crew leads and job site teams based upon the task to ensure people are not overheating," Mass said.